Democrats outnumber Republicans by 12 to 1 on the faculty at the University of North Carolina. The reason? Because most Republicans are climate change deniers. That’s the logic being used by professor William Snider, director of the UNC Neuroscience Center. And if you don’t toe the prof’s line, well then you’re probably guilty of a “microaggression”. 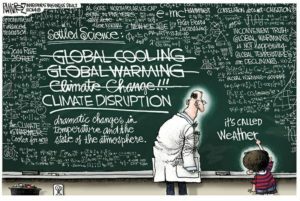 In an opinion piece for The Charlotte Observer on Aug. 23, Snider explained that faculty members at the taxpayer-funded school “are overwhelming Democrats because of their fears of global warming — and because they believe too many Republicans are too skeptical of evolutionary theory,” The Daily Caller reported. Meanwhile, The Daily Caller noted, the UNC in June published a taxpayer-funded guide instructing students that Christmas vacations and telling a woman “I love your shoes!” are “microaggressions”. By the way, the break between semesters at UNC Chapel Hill for the 2016-2017 academic year will last from Dec. 17 to Jan. 10. The guide entitled “Career corner: Understanding microaggressions” — also identified golf outings and the words “boyfriend” and “girlfriend” as microaggressions. At least some students have apparently been required to participate in the workshop.